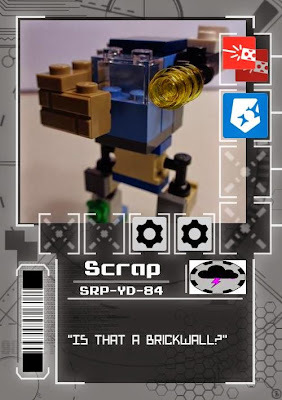 This is one of four of last years (2014) Bricktober sets that you could of gotten for free if you spend like $70 dollars. I picked this up while I was at RavenCon when I ran out to the near by Toys R Us to get some more parts for cover. They didn't have any of the others sadly because I would certainly have gone broke getting the entire set. Say Hello to this Diesel fueled Frame, Scrap! Sort of a Hi-Legs/Chub hybrid feel? Anyways, this awesome frame (I sort of love it, sad I have to take it apart) gets us +5 points. Also the set it self is a really nice building that could look good on the table. Talk about that more in Total. Parts 1 - So many little parts! $19.99 / 164 parts = $0.12 per part, ouch! Your paying for buzz words here I think. -10 points! Total: A B+ set! I don't know why but I really like the 'POS' frame I built! This set though! Gorgeous and I am pretty sure I will at least be fielding the building on my table. Though at a glance I think it it will fit in but in really it more scaled four those that like 4p scale which the stack against our micro figure in hello is suppose to represent.